As agreed at the stakeholders meeting in February, a link to all horses grades will be available on a weekly basis on our website. It will be updated on Mondays after racing and republished. All horses grades are current grades with their age allowances given and have been converted into the new handicap system. Also for purposes of converting from the BHRC handicap system to the IHRA handicap system, please download a conversion table for same. Grade G is for horses that have never won a race. Grade G1 is for horses that have one a grade G-race, who start 10Y behind the grade G horses. Grade E trails Grade F by 10Y and so on up to Grade A, and up to A1,A2,A3,A4,A5. One Win equates to one grade penalty rise. Grade drops will be given to all horses in Grades A to E for every 6 runs, regardless of the number of wins. 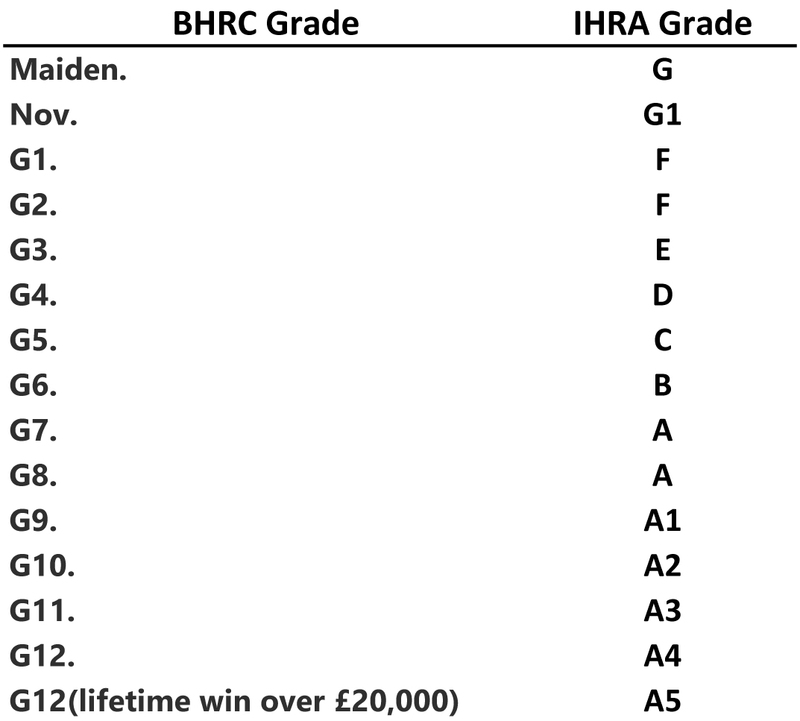 Grade drops will be given to the A5-A horses for every 3 runs, regardless of the number of wins. At the age of 10, a horse is entitled to a grade drop, (or 6 runs, where the case may be), carrying the previous year’s losses, this continues each year thereafter until retirement. At the age of 12, a horse is entitled to a grade drop after every 4 runs. 3 year old trotters are entitled to two wins in each grade before moving up a grade, starting in Grade G and capped at Grade F.
Horses racing in Ireland and bought through the Le Trot System, will be grade F with no lifetime win and will be grade E with 1 lifetime win. ** Should any horse win a final with a purse greater than €3000, and not its heat, the horse will get a penalty grade rise of 2 grades. ** C Class allowance will not be permitted in races with purses exceeding €3000. ** From the start of the 2018 season, a link will be published on the IHRA website, allowing owners and trainers access their horses grade, including the number of runs and will be updated on a weekly basis. ** The reference point for all horses which intend to run in the 2018 season, who competed in the 2017 season will be from their last run.